For filling, in a large skillet cook sausage over medium-high heat until brown, using a wooden spoon to break up meat as it cooks. Drain off fat. Add sweet peppers and onion. Cook over medium heat for 10 minutes or until tender, stirring occasionally. Add garlic; cook and stir for 1 minute more. Remove from heat. Stir in panko, 1/2 cup parsley, and cheese; cool. Meanwhile, trim stems from artichokes so they sit flat and remove loose outer leaves. Cut about 1 inch off the top of each artichoke; snip off the sharp leaf tips. Brush cut edges with some of the lemon juice. Spread leaves apart to make space for the filling. Using a spoon, scoop out the center chokes; discard. Stuff filling between the leaves. 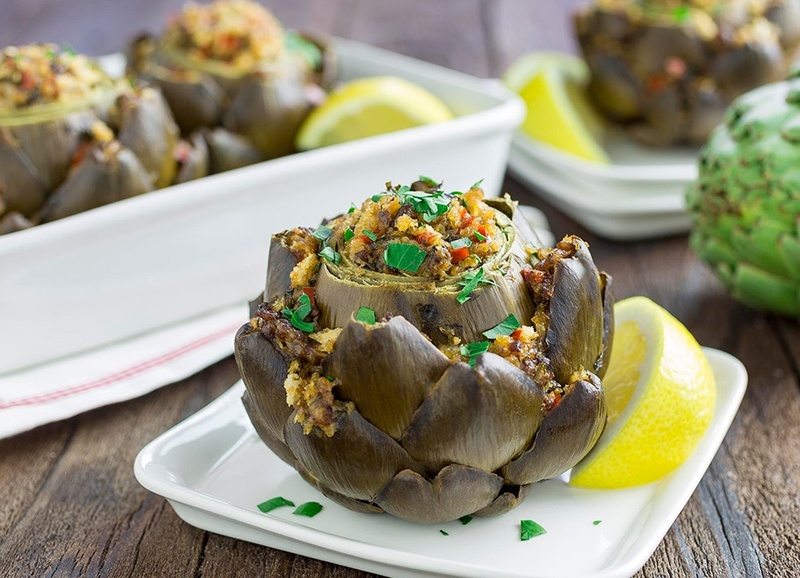 Place any remaining filling on top of artichokes. In a slow cooker, combine the water with the remaining lemon juice. Place artichokes, filling sides up, in cooker. Drizzle with oil. Cover and cook on low-heat setting for 6 to 8 hours or on high-heat setting for 3 to 4 hours-- leaves should pull out easily. Sprinkle with additional parsley and serve with lemon wedges.